This past weekend, I attended a community fundraising event at La Peña Cultural Center in Berkeley. This vibrant venue promotes social justice, arts participation, and intercultural understanding. The event I attended, Thangs Taken: Rethinking Thanksgiving, brought together artist, activist, and community to acknowledge the genocide of ten to thirty million Native Americans and the legacy of US Colonialism. I’ve often heard the story, but never firsthand from the natives themselves. To me, this was a profound, humbling event! It opened not only my eyes but my heart and soul. I am originally from Puritan New England; born and raised in Massachusetts, home of Plymouth Rock. The same Colonial America discussed on stage Saturday evening. As I sat in the audience sipping wine, my mind floating back to the white-privileged, cherry-blossomed childhood I will be forever grateful for—the unraveling of the truth that the Pilgrims and Native Americans never really sat down to a friendly happy feast hit deep-rooted emotional heartstrings. The sweet memories of not only my childhood but also my own child’s classrooms I volunteered in for over a decade playing out the mythic origins of America with a romanticized version of Thanksgiving are heartbreaking: The children making cutesy “Indian” headdresses with paper feathers and Pilgrims, singing My Country ‘Tis of Thee as we gathered them around the tables with an abundance of foods never really landing on any shared plates in 1620. The theory the Pilgrims were friendly to the native Americans, was squashed with the squash that never appeared within the feast. I am happy we played out these fairytale stories with our children in school, providing them with traditional experiences their parents enjoyed as kids. It’s certainly better than saying “Happy Thanksgiving children, now let’s celebrate a massacre!” However, I do think it falsifies our children’s understanding of ourselves and our history. Why glorify the Pilgrims while ignoring facts about the native Americans? Truth is, the Pilgrims never “settled” in New England, the Indians were already settled there. Rather, Massachusetts Governor John Winthrop ordered a massacre resulting in years of genocide and plundering of the Native American resources. In essence, the game continues today. America’s cultural imperialism not only hurts outside nations by control of their resources, it hurts each and every one of us today who consider ourselves native Americans. I am not suggesting that Thanksgiving should become an occasion of yearly guilt. But we should acknowledge the sins of our collective past, so future generations don’t repeat history. Despite my New England roots, I’ve become a postcolonial critic questioning the “us vs them” ideology and the cultural impact of imperialism. The negativity of “othering” generally stems from ignorance, and a tendency to fear, distrust or misunderstand people outside of our “group.” This ideology is still used today in America by politicians wishing to divide and conquer both domestically and abroad for land and natural resources, keeping us in an unsustainable war economy with overall social decay. What’s happening now in North Dakota with Standing Rock and the oil pipeline, is like playing out 500 years of our violent history. 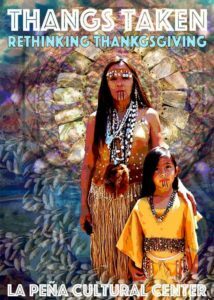 If anything good comes from this, it will change the way Americans view Thanksgiving–beyond overeating and farting in front of a football game, to thinking with an open heart about native Americans whose bloodlines were crushed in a sea of lies. But more than this, how Standing Rock itself resembles the moral soul of our nation getting beaten down daily by police that “serve and protect” an oil pipeline rather than our people. Law and order is a beautiful thing until it becomes a lawless chaos. The true anarchist is difficult to recognize in a society with law enforcement shooting rubber bullets and water cannons at innocent protestors protecting OUR water—Our collective land—Our environment and human rights. Standing Rock is not merely a battleground for indigenous sovereignty. It represents at its core base, a struggle for ALL American people with a federal government corrupted by corporate power. Standing Rock represents a collaborative colonialism of elite power exploiting oil within a global political economy, betraying the conscience of our country. With social conscience, comes the understanding that I am not angry. This post is not born of anger. It is motivated by positive energy and a humble love, a wish to seek peace and justice for humanity as a whole. So yes, let’s spend time with our loved ones, enjoy a turkey dinner and feel gratitude for all we have. But not at the expense of ignoring an entire race of people, their culture, and history. Let’s teach our children Thanksgiving in a socially responsible way, building a world based on peace and justice that we can be truly thankful for.